The California Teachers Association has embarked upon a strategic planning process, at the direction of its State Council of Education, and under the guidance of the Labor Education and Research Center (LERC) at the University of Oregon. This strategic planning process—entitled “Your Voice. Our Union. Our Future.”—is about the future of CTA. The goal: Make sure CTA is positioned in the best possible way to help all students and educators succeed. In order to accomplish this goal, CTA will rely on the people that know the organization best—the members and the staff. Initial committees have been formed and work has already begun on the initial research phase of this project. School Board mixer is coming up tomorrow! Would you like to meet some members school board trustees David McCallum, Sherie Mahlberg, Michael Kitzes and/or Teri Nutt tomorrow? Stop by Blondies Bar and Grill at 555 Main Street (the old Creekside Cafe) to share what’s on your mind. The meeting will follow our rep council, so, building reps, just hang around! 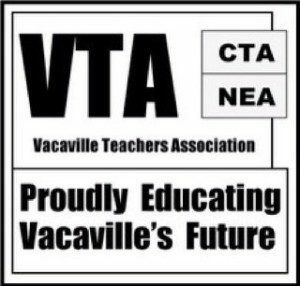 On Wednesday, 11/28/12, the VTA bargaining team met with the District to verify the funding levels for our district with the passage of Prop 30. We were able to agree that our funding level is $5228.06 per ADA, which places us on the 3.5% column of our contingency chart instead of the 6.5% column. -only 1 furlough day will be taken (5/31/13) instead of 6 furlough days. -Schedule K chart stipends will be restored to 50% levels. -Department Chair and Teacher-in-charge stipends will be restored to 100% levels. -Any and all retroactive pay will be received on January pay warrants.